Product is available as an on-premise, hosted, and cloud solution and are all from a single code base all created from the same code base. Product was created especially for order-driven manufacturing. In that, the patented process allows for better scheduling, quality control is fully integrated with manufacturing, an easy drag-and-drop customization makes it simple, easy lean feature helps streamline the workflow, graphical display shows everything at a glance, and government reporting requirements are fully supported. Infor ERP Express (Visual) quickly converts customer requirements into manufacturing requirements and then executes them efficiently. Lean concepts eliminate redundant or wasteful steps that users may be forced to go through with other manufacturing software. For manufacturers, ERP Express supports mixed-mode production strategies, including engineer-to-order, make-to-order, assemble-to-order, and make-to-stock. ERP Express also displays all key statistics on a single screen, helping ensure that schedules are met, materials arrive on time and costs are in line with estimates. Infor is the 10th largest software company in the world, with approximately $2.1 billion in revenue,. Over the past six years, Infor has grown to become one of leading business software companies in the world by building and acquiring some of the best solutions in the world. A company unparalleled in application breadth, market experience, open technology and global reach, Infor has 8,000+ employees, direct offices and implementation and support capabilities in 100 countries, and over 70,000 customers worldwide. Creates an engineering plan or bill of material (BOM) quickly and easily with a full-color, graphical interface, and then uses the design to automatically create a quote and/or work order. Provides a comprehensive view of the materials and operations involved in the engineering process, including both macro and micro views of the business. Captures costs as changes occur, ensuring up-to-date and accurate costs. Lets you choose between actual costs and standard costs. Links purchases directly to existing work orders through the Purchasing or Manufacturing modules, earmarking costs that are specific to jobs. Creates professional and comprehensive quotes, determines realistic delivery dates based on material and resource availability and turns quotes into sales orders. Users can create quotes quickly and easily by copying them from another quote, an existing work order, or a BOM, and then modifying the new quote to match customer specifications. Users can estimate costs for material, labor, burden, and outside services, and automatically create sales and work orders from quotes once the quote is accepted. Manages a large volume of customer orders and meets varied fulfillment objectives. Helps users manage customer order allocation and new product deployment planning throughout the supply chain. Optimizes fulfillment, reduces order processing cycle times, provides cost-effective sourcing of inventory to customer orders and increases revenue through substitution, cross-selling, and value-added services. Retains existing customers and acquires new accounts by tracking everything there is to know about prospects and customers. Schedules activities, assists in sending letters and emails, and keeps detailed notes about conversations with contacts. Provides histories, tasks, and other sales data for every contact and includes access to important back-office data such as accounts receivable, current part inventory, return material authorization (RMA) status, estimates, sales orders, credit status and shipments for each customer. Coordinates material purchases by providing online decision support that simplifies record keeping. Helps control inventory, enhance cash flow, and shorten delivery times. Handles all types of purchases, including inventoried items, supply items, outside service operations pertaining to a manufacturing order, and subcontracted items that require delivery of components to a vendor. Accommodates drop shipments at locations other than the primary ship-to address, such as warehouses or customer locations. Provides standard form reports like purchase orders, acknowledgments and order lists for purchasing personnel. Also includes analytical accounts’ payable-related reports-including purchase order lists and accrual reports. Ensures the most efficient use of materials and resources, and provides the necessary information to deliver products on time through Global Scheduler and Scheduling Window. ERP Express was the first software system to feature concurrent scheduling that considers both material and capacity constraints when generating shop schedules. Manages the balance between supply and demand, providing a comprehensive analysis of your material situation, including the suggested action to restore balance. Suggests when to release supply orders based on the most up-to-date supply and demand information. Helps reduce inventory, increase manufacturing productivity and facilitate cash flow. MPS translates business plans into production plans using firm planned orders in a true multi-level, optional component scheduling environment. Drives the manufacturing process, and prevents shortages, costly expediting, last-minute rescheduling and inefficient use of resources. Seamlessly integrates all ERP Express’s features, including inventory control, material and labor tracking and reporting, purchasing, and scheduling. Provides companies with complete control over production operations, eliminating redundant data entry and ensuring consistency and accuracy throughout the shop floor. Allows decision makers to view and analyze key factors and performance trends in sales, purchasing, production and finance, and to see both summary and detail-level data. Displays summarized data that reflects the overall status of the enterprise. Highlights areas that need attention before situations become critical and costly by through key performance indicators. Helps decision makers trace problem areas directly to the source to eliminate the possibility of the same problem arising later. Provides greater accuracy and immediate access to inventory information throughout the company. 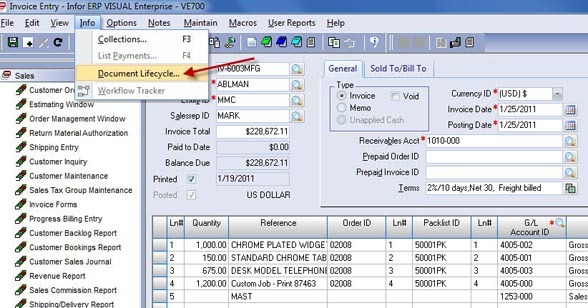 Automates part-tracking by adjusting inventory whenever a part transaction occurs. Designates inventory items as purchased, manufactured, stocked, or non-stocked. Tracks materials and costs on a per-project basis, providing an online, in-depth, time-phased, netting evaluation of the complete supply and demand situation for parts. Also provides companies with a complete profile of any part in the system. Breaks down the total quantity of inventoried parts into various dimensional sizes to give companies more control over their inventory. Calculates the correct total order quantity by making necessary conversions when a specified number of pieces are issued by dimension. Adjusts all values related to a part transaction to help companies purchase, receive, and enter a material requirement simply by entering the number of pieces of material, the required dimensions, and the warehouse location. Performs a physical inventory of specified numbers of pieces and dimensions. Establishes controls and manages the process of making changes to documents and drawings, parts, BOMs and routings, work orders, and projects. Measures productivity considering the contribution of a job or product toward company profit, calculated as price of goods sold minus cost to produce. Increases profit by working a schedule that will increase throughput, using measurements not commonly found in ERP and MES systems. Accesses a variety of reports and inquiries: actual or expected throughput reports; and utilization, contention, and material constraint inquiries. Displays “what if” scenarios to help determine whether a request is feasible. Passes information from one person or department to another through an automated process cycle, integrating policies and procedures with information flow according to predefined conditions or rules. Provides master, predefined, and user-defined workflow templates, ensuring a logical, repeatable flow of data. Releases defined workflows into the ERP Express system, where they operate behind the scenes. Notifies users of tasks and activities that require action. Routes information, such as customer orders, purchase orders, or engineering changes, to internal and external participants in the business process, incorporating approval functions along the way. Allows users to conveniently track and monitor the status of documents. Provides a BOM and part-import interface for 3PL applications, which must generate a properly formatted flat file. Validates all fields, recalculates required quantities, and produces a log of all transactions during the import process. Transmits important information to appropriate persons, either within or outside the company, using familiar email features. Delivers alerts to user workstations, pagers, cellular phones, printers, and fax machines. Defines important events within the manufacturing process, creating and transmitting messages to key personnel. Allows employees to focus on other business without needing to constantly check in, while ensuring they’ll be informed of-and can act on-critical information. Analyzes and manages enterprise and accounting data providing the methodology to build customized queries and forms, define business graphics, and create complex cross-tabular reports. Also helps pinpoint resource contention-otherwise known as bottlenecks-to improve shop floor schedules, increase on-time delivery, and improve profits. Manages documents that control the return of parts previously sold and shipped to a customer. Contains an ID status and other identification regarding who is returning the material, and for what purpose. Creates trace records for each lot number, serial number, or other grouping of a part, and automatically tracks each part as it flows through your plant. Assigns additional information, including a description, expiration date, and other user-definable fields. Tracks parts from material receipt through product delivery, as well as all intermediate levels. Prompts operators for additional information when receiving and issuing material and reporting labor. Reviews flow of material lots and serialized parts as they move through the manufacturing process. Makes quality assurance an intrinsic part of your workflow. Establishes, tracks, and manages every engineering activity and supply chain expectation, while supporting business growth and profitability goals. Creates critical manufacturing specifications for products, processes, equipment, and measuring devices, and improves enterprise team collaboration with vendors, customers, and employees. Provides tools to automate associated design, pre-production, production, and post-production activities; expertly manage business performance; and easily collect, control, and analyze quality system data.